Samsung and Huawei are in a tight race to commercially release the world’s first smartphone with in-display camera technology, but the global leader in shipments just pulled (narrowly) ahead by confirming an earlier Galaxy A8s announcement. It’s probably no coincidence that both companies took to Weibo today to officially schedule highly anticipated product launch events for December 10 and December 17. The two Chinese microblogging accounts shared eerily similar teaser images revealing the groundbreaking outlines of their impending mid-range handsets. 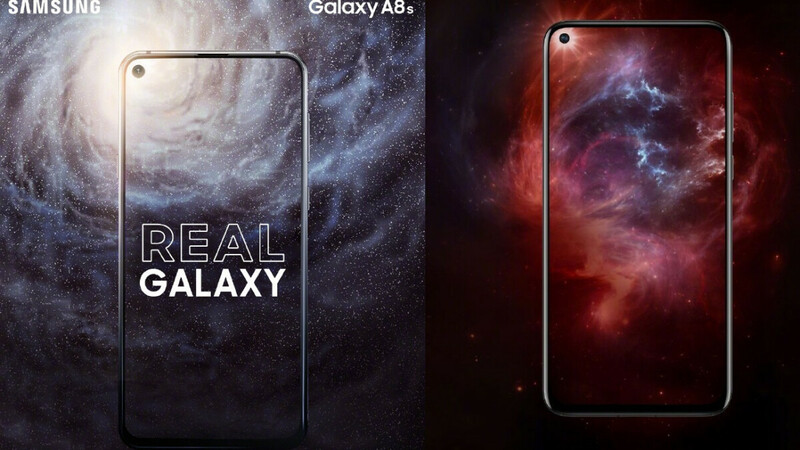 The Samsung Galaxy A8s and Huawei Nova 4 will both adopt (nearly) full-screen designs with no “conventional” notch, almost non-existent “foreheads”, and relatively thin “chins.” A small hole appears to be drilled into both displays to house the selfie camera, coincidentally located in the same top left corner. Of course, US commercial rollouts are by no means guaranteed (quite on the contrary if we’re talking about Huawei’s phone), but these are also momentous products for what they might anticipate. The Galaxy S10 is no longer tipped to look identical to the A8s, nonetheless aiming to employ the same general “punch hole” aesthetic. As for the Huawei P30, the rumor mill has been surprisingly quiet until now, but it’s safe to expect some sort of a resemblance with the Nova 4 as well. Keep in mind that the Huawei Nova 4 has already been seen out in the real world (complete with a headphone jack), while the key Galaxy A8s specs and features were purportedly revealed just last week, including a grand total of four cameras. That’s a lot to be excited about, don’t you think? They look exactly the same ! same screen from BOE on both of them. I love how the background picture from Samsung is a Galaxy and from Huawei is a SuperNOVA. Both are galaxy images. I am impressed by how subtle you are to insinuate Huawei's image is their own idea.